The Danube Cycling Path is the best known cycle route in Europe, and a great destination for anyone planning a cycling holiday. Suitable for cyclists of all ages and abilities, here's all you need to know about the Danube bike trail. The Donnau Radweg follows the River Danube from its source in Donaueschingen, Germany, and ends in the Black Sea 2860 kms later. The most popular section though, is the 300 kilometres leading from Passau to Vienna. Each year, thousands of people of all ages and abilities cycle this interesting part of the route. Looking for travel inspiration for your next holiday? 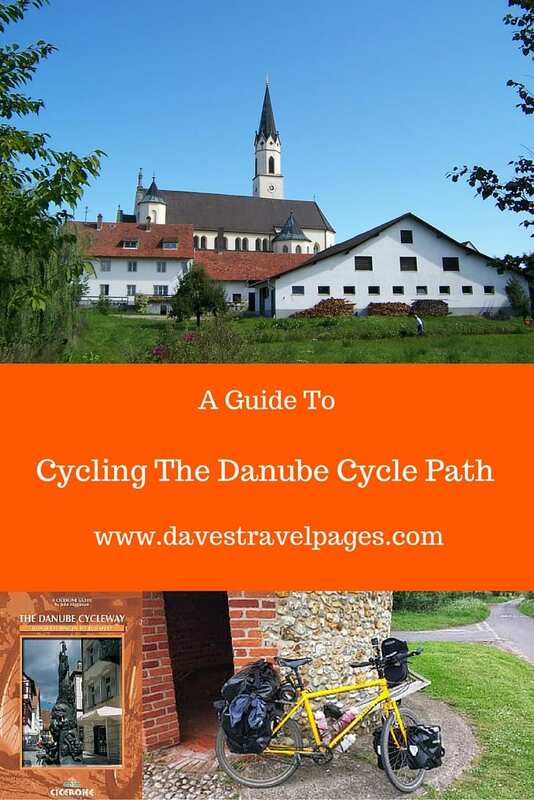 Read on to find out more about biking the Danube Cycle Path. I first cycled the Danube Cycle Path, as part of England to South Africa cycling route back in 2006. Even then, it was a well-established long distance cycle path, and the facilities and amenities have improved over time. I went cycling along the Danube again in 2016, during my bicycle touring trip across Europe from Greece to England. The Danube Trail is suitable for people of all abilities. It combines plenty of scenic beauty and places to see, easy terrain, and little to no traffic, making the Danube Cycle Path the most popular in Europe. It also has numerous spurs, such as the River Danube to Lake Constance cycle route. Suitable for people of all ages, abilities, and budgets, you can cover the entire route in less than a month, or break it down into small sections. Here, I will describe the most popular section which is 300 kms long from Passau to Vienna. This can easily be covered in a week, and is popular among active people seeking active getaway breaks. Take two, and it will allow plenty of time to enjoy the sights along the way. Bicycle touring means different things to different people. Some travel lightweight, and some a lot heavier. Therefore, I am not going to produce a massive list of items to bring here. You might want to check this out though – Bicycle touring gear for a one week cycle tour. My one main tip, is to bring adequate waterproof cycling clothes. Don't overlook a waterproof beanie! The chances are, it will rain on at least one day cycling the River Danube cycling path! What if you don't have a bike or gear? No problem – There's plenty of Passau bike hire companies who can provide bikes and panniers. There is no excuse now as to why you can't cycle this great route! Remember, the most important thing you should take with you when bicycle touring, is your enthusiasm! Firstly, it is probably best to mention that most people choose to cycle ‘downstream'. I would suggest you also do the same. This way, you don't need to keep such a sharp eye out for cyclists riding from the other direction. Here then, is a rough cycling itinerary for the route from Passau to Vienna. It highlights what you might see along the way, the main points of interest in each place to stop, and accommodation options. “Passau Panorama 080420 2” by Aconcagua – Own work. Licensed under CC BY-SA 3.0 via Commons. The German city of Passau is an ideal place to begin cycling the River Danube Cycle Path. It is also an interesting city to explore before you start those wheels rolling. St. Stephen's Cathedral and the Old City section are certainly worth visiting, and there are many examples of Gothic and Baroque architecture. You can rent bicycles here at the Passau bike hire shops if you need, have bicycles repaired, and stock up on supplies before the cycling route ahead. A gentle 45km cycle ride to get into the swing of things along the Danube bicycle path. It is so gentle in fact, you probably won't even notice that you have left Germany, and are now in Austria! Along the way, you might want to visit the Engelszell monastery. It is the only Trappist Monastery in Austria. Finish off the day's cycling in Schlögen, which has a full range of accommodation. This is another short day's cycling of 44 kms along the Danube Cycle Path. The beautiful River Danube will be a constant companion, and you will see swans, woods, and the occasional castle! 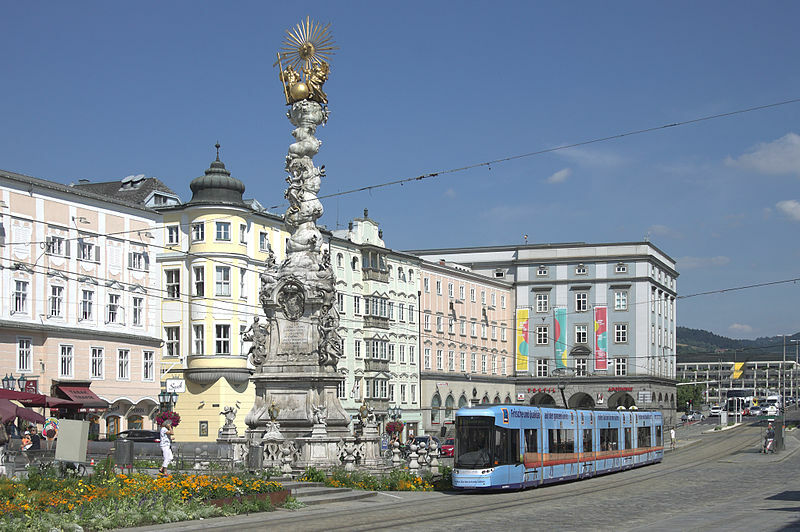 The day finishes in Linz, which is Austria's third largest city. If time allows, take a full day off from cycling in order to explore the city. “Linz, Hauptplatz” by darkweasel94 – Own work. Licensed under CC BY-SA 3.0 at via Commons. A slightly longer day of 60 kms today. This may be a day of emotional extremes. On the one hand, there is the absolute joy of cycling the Danube Cycle Path and enjoying the surrounding beauty of wheat and sunflower fields. On the other, there are monuments and a concentration camp in and around Mauthausen. Spare some time in reflection. Make your way on to Grein, where there is accommodation including camping, guest-houses, and hotels. Another short day of cycling along the Danube at 44 kms. If you arrive early enough, you can probably see most of this small city in a half day. The most important building, is the massive Melk Abbey, which is a Benedictine Monastery. Melk has accommodation to suit all tastes and budgets. This is the shortest day of the Danube cycling itinerary. It is just a 25 kms cycle ride from Melk to St. Pölten. This does allow plenty of time to see both places though. St. Pölten is a large city, and whilst not perhaps as inspiring as some of the other stops, does have a lot to see and do. There are a handful of small museums, and The Kremsergasse is an old commercial street with many baroque buildings. Part of the reason why I would suggest to stop here, is to get a nice early start the next day in order to reach Vienna. It's an 87 km cycle ride from St. Pölten to Vienna. Once more, the Danube cycle path keeps you well shielded from traffic, and it is a joy to ride. You will pass sunflower and wheat fields, cross streams, and enjoy the countryside up until the point you enter Vienna itself. Once there, you should spend a day or two enjoying all that this fabulous city has to offer. 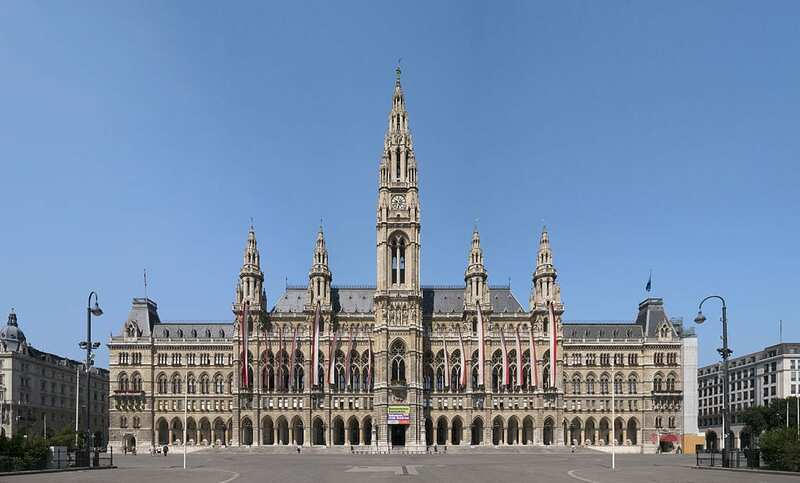 “Wien Rathaus hochauflösend” by Thomas Ledl – Own work. Licensed under CC BY-SA 4.0 via Commons. If cycling isn't your thing, then there are plenty of other ways to explore the River Danube. One option, would be to take a river cruise. Another would be to rent a car, and visit the main points of interest along the way. It is a fascinating area to visit, no matter how you decide to travel! There are tonnes of online resources you can check out about the Danube cycleway. You might like to start with my two travel blog entries which document part of the route. The first covers the cycling route from Blaustein to Schonau. The second covers from Schonau to Budapest.
. It is one of the best cycling guides I have ever used. I hope I have inspired you enough to at least consider cycling the Danube Cycle Path. Bicycle touring is a great way to discover a country or region, and this is as gentle and traffic-free as it gets! Have you cycled the Danube bicycle path, or are you planning to? I would love to hear from you. Please leave a comment below. Do you know of anywhere in Passau to rent a tent? I don’t personally. You can contact one of the bike hire companies though and see if they also rent equipment. Either that, or buy a cheap 30 euro tent from Aldi when you arrive! Sankt Pölten is far off the Danube. The usual path would take you through Krems and Stockerau, through beautiful wine country and the Vienna Woods to enter Vienna by the Kahlenberg (a hill that is the last extension of the Alps before the eastern plains). Yes I also passed through Krems (which was wonderful). I included Sankt Polten in order to provide a slightly different route than normal. Cheers. Already on my this, this one! Though, I’m not sure which direction I’ll go in. But, at the moment, it seems like I’ll be going upstream. Thanks for that additional information!! A great post and a great way to travel!